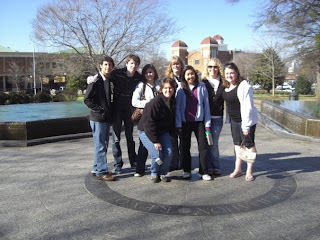 A group of us in Kelly Ingrim Park in Birmingham, AL. Behind us is the 16th Street Baptist Church. I hate to be cliche' but there is no other way to put it. This trip has been life changing, but what is more amazing about it is that it started way back in August when I signed on to become a coordinator for the trip. Four months of planning was a lot of work but it totally payed off because the whole trip went smoothly. I am greatful for the donors that funded the trip and to Jodi Thesing-Ritter who was a fabulous advisor and such a great role model to the coordinators. What I loved about the trip was the shared commodiry that we all had a students to learn about the civil rights movement and take the lessons learned and apply it today. That was my intention for the trip since I am involved with the current movement for equal rights of the LGBT community. I would have to say there were two favorite parts of the trip, Ebenezer Baptist Church service and the friendships that made and deepened. For the church service, you didn't have to be Christain, you didn't have to believe in God, you just felt a sense of community and when the regular parishoners came around to greet us and introduce themselves that was just a great feeling. The music was absolutely amazing and there is a clip of it on this blog. What I got out of the service was that sense of community but it also made my faith deeper and gave me a sense of where to focus my life. The message for the pastor's sermon was how people have made great strides but at the same time had to perserve to get there. I should always listen to my heart and not take the easy way out. When it came to friendships, I loved it. I could bond with other peers through a trip that is life openeing and something that makes you step out of your box. I loved it! I cannot wait for this opportunity again, and now I know what to make better and what to do about that!